How Are You Straining Your Eyes? One result of vision improvement is becoming more aware of habits which cause eyestrain. Often if our eyesight is less than perfect, we may be constantly straining our vision without even realizing it. My personal “favorite” (said with a groan) is leaning forward into the computer to see better whenever my eyes get tired, rather than taking a break. I’ve pushed myself to perform visually for most of my life, and it took me a long time to learn that the feeling of eyestrain was not normal. My eyes and mind may not have been relaxed when I was a child even when I was asleep! A client told me recently that he’s noticed he raises his eyebrows, or “crunches” them, when he’s trying to see. 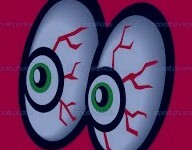 Another new client asked, puzzled, “How do you know when you’re straining your eyes? When they feel tired?”. Yes, fatigue is certainly one indication that you’re abusing your eyes. Another, which seems obvious, is pain or soreness, especially in the little muscles around the eyes, or in the brow or cheeks or shoulders. People can clench their jaw when they are determined to see, then hold onto that tension instead of relaxing it. The eyes are obedient servants of the brain, and will do their best to see whatever is in front of them. This includes seeing through an eyeglasses prescription, and if the prescription is too strong, that will induce a strain. So will doing close work like reading while wearing glasses for distance. I cringe when I think of the children getting their first pair of distance glasses because they can’t see the board in school well enough, then being told by parents and teachers to wear those glasses all the time. This is a sure road to vision decline. See this article. As with many other things in Life, awareness is key here. If you notice you’re doing something destructive to yourself, you can start learning to do it differently, but you have to realize you’re doing it first! A simple example is reading, and your eyes getting tired and sore. You can stop right then as soon as you notice your eyes complaining, and take a break or do some palming. If instead you just keep going (and straining! ), you’re not doing your eyes any favors. Poor visual habits like squinting, or indeed any form of “trying to see”, may come from the idea that our eyes have to be pushed to perform. The harder I try, we think, the better will be my results. Intending to see is one thing, trying to see is another. The visual system is meant to receive input, effortlessly, not strive and struggle to grab hold of it. Consider seeing gently, inviting in the images in a soft welcoming way. Now doesn’t that feel better? Finally, remember healthy eyes are part of a healthy body, so if you’re doing something unhelpful to yourself like skimping on sleep, or hanging onto a resentful or grumpy attitude, it will affect your eyes too. Be grateful for all the miraculous sights your vision delivers to you every day, and take the time to really savor them. I have to watch out for being impatient and rushing, and I know this affects my vision. I can think “I can’t see!” if I can’t see something instantly, when a calming breath and an extra second will bring it right into focus. Like most people you know, eyes don’t like to be hurried. Easy does it! Vedant, hi. It’s good that you’re aware of the strain you feel, believe it or not. You are hearing the cry for help from your eyes. When are your eyes NOT strained? When you’re away from the computer? When you’re outside playing sports? After palming? Are there things you enjoy reading that don’t strain your eyes? Maximize what feels good, and start to eliminate what doesn’t. Hey I have to ask 1 thing, I have been trying bates method to improve my vision. But i feel strain even i dont wear glasses and read book or see some video in my mobile. This strain in eyes and also its hurting my mind. I feel constantly pain in my brain and my eyes always feel tired while reading, though I use central fixation to read. I also keep in mind to blink frequently. Kindly help out this thing, It will be appreciated a lot. Thanks, again, for reading, my clear-eyed friend! Previous Previous post: Half the world? Not if we can help it.